You must be logged in as a Fan to join Fan Clubs. You must be logged in as a Artist to become friends. 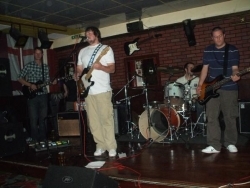 Ten Thousand Pieces are a four piece indie, alternative rock band based in Haworth, West Yorkshire. Starting off from former neighbours and friends Ben and Jay as an acoustic unit, the recent addition of drummer John Holmes and lead guitarist Chris Jackson has transformed the songs and the sound. Ten Thousand Pieces have recently recorded a 4 track demo CD of their own material at Calder Recordings and plan to promote these and other original material playing live in the local area. You must be logged in as an Artist or Fan to add comments. This artist does not have any shows online yet. If you are an Unsigned Artist looking to get signed then you have come to the right place. We feature resources and an outlet for you to feature your music and be seen by the world. Our simple goal is to help you get signed. Get your music heard by millions and distribute it around the world. We have tons of fans waiting to hear your music, so what are you waiting for? Create a free profile and Get your hard work out there now! WE HELP UNSIGNED ARTISTS GET SIGNED - JOIN THE UNSIGNED COMMUNITY TODAY!! !